I think DC forgot that we're supposed to have spring in between summer and winter. It was in the high 70's/low 80's when I left for my run tonight. By the time I got home I was a sweaty beast. I forgot how hard running in the heat is at first when my body doesn't have time to acclimate to the warmth. I still managed to crank out 4.48 miles in 43:38 averaging 9:40, but it wasn't easy and there was lots of walking involved. I also had a new friend along for my run last night. It came in the mail over the weekend when I was home in PA and I'm so happy to have it. I won it in a giveaway a while back and finally got around to deciding which style I wanted and who to list as emergency contacts. 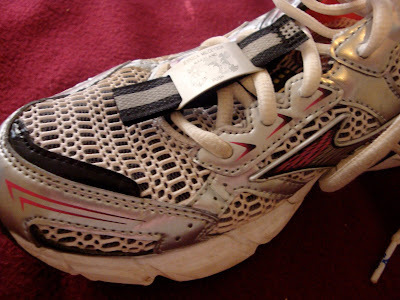 I used to carry my license with me on long runs when I wore my fuel belt, but on shorter runs I wouldn't carry any ID, which is not a good idea. Now that my Road ID is attached to my sneaker, I don't have to worry about it anymore. I'll have ID with me on short and long runs. 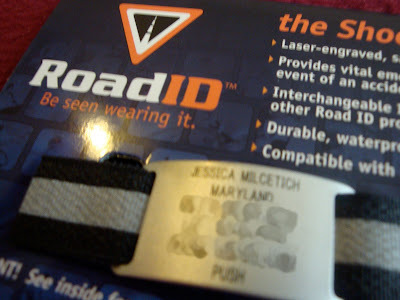 Do you carry ID with you on runs? How do you do it?